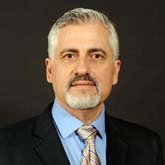 Dr. Kaloush is a registered professional engineer specializing in pavements and materials. He is the co-founder and director of the National Center of Excellence on SMART Innovations, chair of the Transportation Research Board subcommittee on Pavement Materials and the Urban Climate, and faculty advisor for the ASCE student chapter. His research interests include both asphalt and Portland cement concrete mixtures design, characterization, advanced laboratory testing, and field performance evaluation. Dr. Kaloush is also known for his work on modified pavement systems that include the utilization of crumb rubber and fibers. Dr. Kaloush teaches courses on highway materials and construction, performance evaluation and management, and sustainable materials and energy use. Hartz, D. A., J. S. Golden, A. J. Brazel, B. C. Hedquist and K. E. Kaloush. 2006. Case study of thermographic observations of surface materials' cooling rates and neighborhood design in suburban Phoenix, Arizona. Poster presented at the January 28, 2006 American Meteorological Society's Sixth Symposium on the Urban Environment, Atlanta, GA.
Carlson, J. D., J. Jo, K. E. Kaloush and J. S. Golden. 2009. Evaluating the energy balance of alternate parking lot materials in hot arid climates. Presentation at the January 2009 American Meteorological Society UrbEnv Symposium.